Delving deep within my Lead Mountain for robed acolytes I came across this Mantic Goblin Sneek. 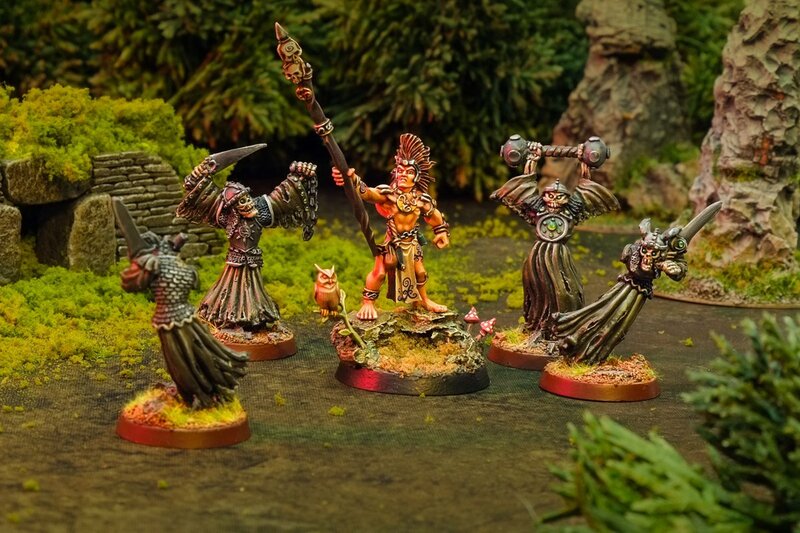 He’s been painted with fire-motif robes as he will be joining my warband as one of Clyro Burns’ assistant sorcerers. 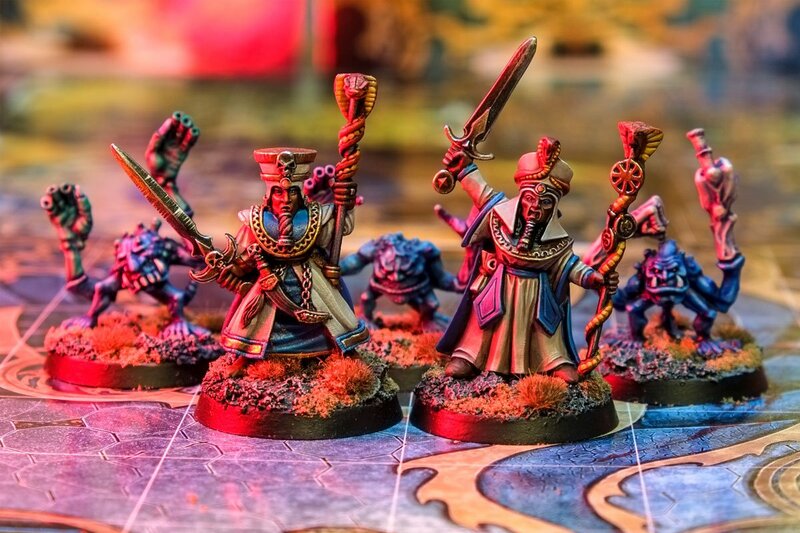 This miniature is out of production, which is weird as I still think of Mantic Games as the new kids on the block and not a venerable old company with the luxury of retiring its older offerings. Time flies. Only yesterday I was horrified to be told it was my tenth Twitter anniversary. Next thing you know I’ll be off to a field to drink cider and watch Fairport Convention unironically. In 2016 I had a weekend of Frostgrave gaming looming and was desperate for fully painted figures. 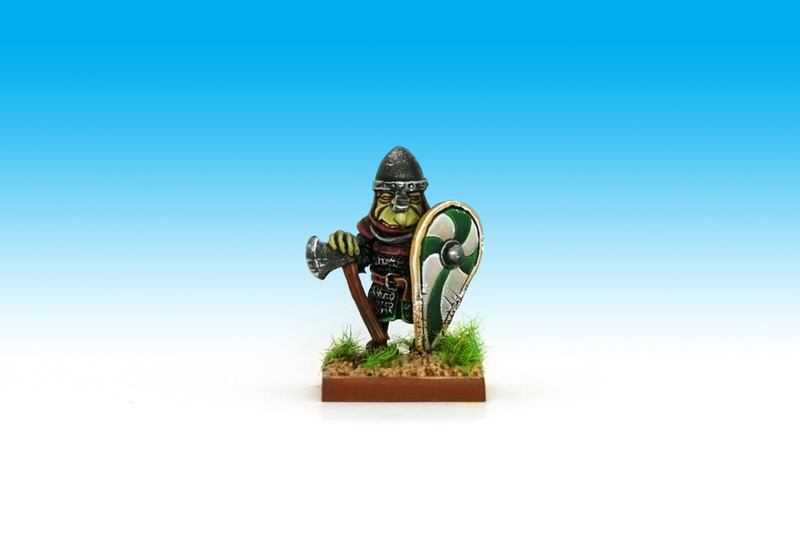 I quickly rebased a Ruglud’s test miniature and slipped him in with my Chaos Thugs with a matching shield. It established a precedent, and I’m now seeing what other greenskins I can paint as part of this multiculti force. Though I’m working on these guys with Dragon Rampant in mind, I’m wondering how to get them onto an Age of Sigmar battlefield. Kairic Acolytes is my current best bet, but their compulsory weapon options don’t make them a perfect fit. Suggestions welcome! Clyro Burns and his acolytes in the City of False Idols. Brilliant work as always! Love seeing this group grow! Could you not field him as a Gaunt Summoner with Chaos Familiars? You would need to paint one more but would be a perfect fit! The Summoner is even able to cast Infernal Flames! It is nice watching a collection grow gradually. That’s quite a good idea, actually. I’ll dig up the White Dwarf with the warscroll in and have a look. That’s a nice fig, who sculpted it? The Gaunt Summoner idea is great. I second that.